I hope you are doing well and happy this season. Actually all year long! I am thinking about you and Tribe as I am observing a recurring feeling. It has been a while. I have attached the Toronto TTID with an updated email address. Enjoy Christmas and all the best in 2012! Thank you. I notice FAQ is not updated since May and I wonder how you doing? I think of you often and how much you give to me and all of the tribe folks, I am filled with thanks to you. If you ever want to just talk feel free to call or write me an email. Just know that you have helped me and I am still in the process. Thanks and very best wishes! In the meantime, I'd like to wish you and your family all the best and a great Christmas! Do you manage accounts, or if u can refer me to anyone, please contact me. You might consider telling me what you have in mind. Hello! I wish you a happy New Year! Are you making your world trip till now? Very long journey, isn't it? I am worrying that something might go wrong about you. Your Good Health! Your happiness! I want to attend the TT workshop in Germany. I will appreciate if you could provide me some information for the same. See the FAQ Index page for upcoming events. Hi Ed How are you doing? I really enjoy reading what you have to say and thought your insight that everyone gets what they want in the bookmarket wizards was hilarious only so because it is so right. I have got what I wanted recently and that is to be right on my back side and in need of some help, I have developed a very clever trading system which really works well but I have gone broke not because of the system but because of my inability to control my emotions whilst under pressure, My system is not conventional and It is something that I have developed and is original and I feel I only have a short period of time to make the most of it until it stops working or market conditions change to render is less useful. My feeling are now that I am far smarter because of what has happened to me but I need a second chance in order to put into practise what I have learned about myself from my experiences. I was hoping that you might know how this feels and be interested in helping me put into practise what I have learned and help me make the best of my information. "Chance" indicates something fortuitous and unpredictable, subject to luck. 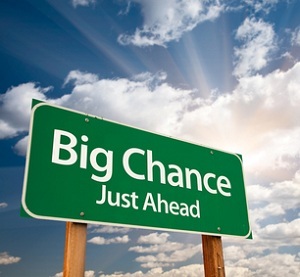 Chances come in various flavors, including: last, second, best, some, of-a-lifetime, fat, big and any. You might consider taking your feelings about <second chane> to Tribe.